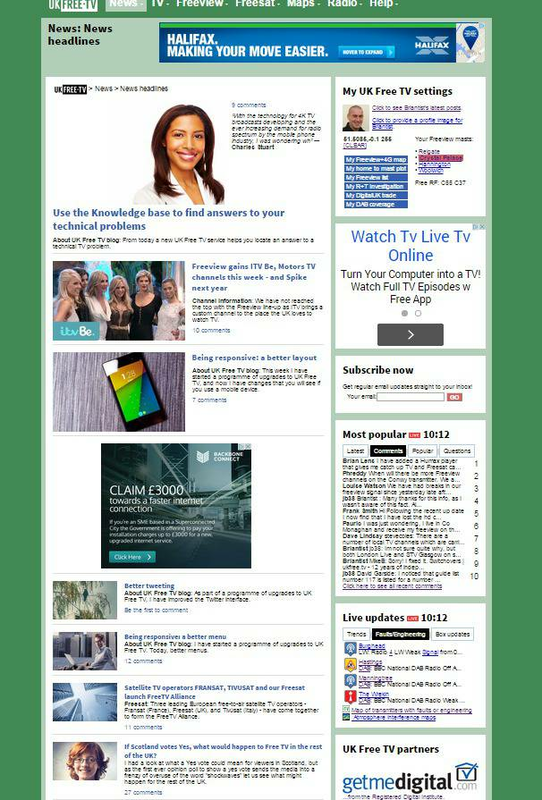 I really trust that you will find the new email format useful, and that UK FREE TV is more attractive to use. I have been working on making a considerable number of changes to the "back end" of UK FREE TV over the last weeks. This makes the site faster and more reliable, but new menus and responsive mobile layout changes aside - there wasn't really that much for you to look at. Today I am very happy to tell you that I have made a considerable improvement to the email notification system. Whilst I know many thousands of you read the existing email, it left a lot to be desired in terms of content and layout. As you can see from the above example, the new layout is much more attractive. It is easy to read on mobile phones and tablets, and the selective use of images makes it easy to understand. A selection of "Trends". These are news articles from around the web that inform you about what is going on in the word of free television. This is a carefully curated daily list. 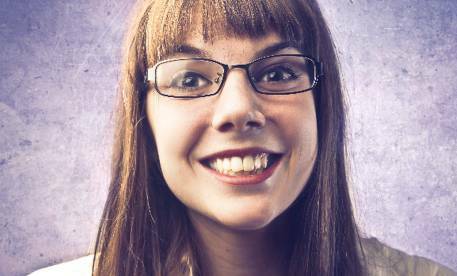 I hand-pick these stories for you each day. 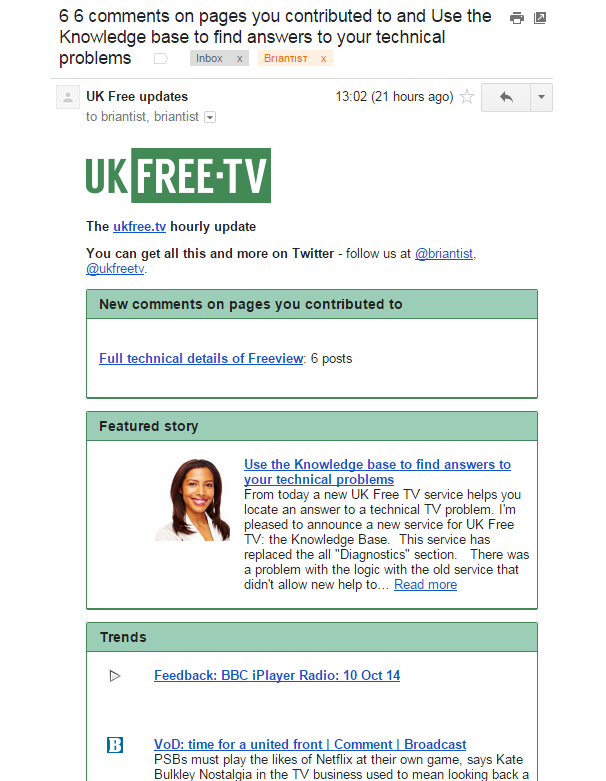 You will see a list of new articles that have been added to UK Free TV since the last email – if there are any. And then a list of the four most popular pages on UK FREE TV this week. If you want this service and you don't already have it, use the "SUBSCRIBE NOW" box in the right hand column of each page. The menu pages have an improved layout. Featured stories have larger photos, and there is a more nuanced use of comments. Every story has a picture and they are all the same proportions (even when old items have the square images). This I have created by going to the BARB site and adding up the viewing figures for all of the free channels on each platform. I've even added up the premium channels (sport and movies) too. Go straight to IE11 is the general advice. You could also try another bit of software for email - I must admit that I used to use Mozilla's, but since its now all web-based, I dont bother. MikeB I tried IE 10 and 11 and the problem persisted within my email programme. I had a look at Thunderbird as it seems to be updated regularly but with that when you try to read a link in an email it just opens it in your default browser which rather defeats the object of having an inbuilt viewer like I have with my pop3 programme. But it did give me an idea. Instead of trying to read the links in Brians emails directly in my mailer if instead I right click on the link I get the option to open in it another window and if I do that they open in Pale Moon which is my default browser so I think that's the way to go for me rather than get frustrated with Brians new format. It's all very odd as I subscribe to various html email alerts and my email programme deals with them perfectly and it's just Brians that don't work. Job done as far as I'm concerned. Please, Please - bring back UKfree.TV ! I don't know what has happened to your website, but effectively is unobtainable. It is only by wandering through the news items that I now know what should be there. Let me explain - As far as I can see there are NO menus, only the centre column of news items. The left and right columns of the screen are always blank. I thought it might be my computer (Google chrome on Windows Vista), so I tried Internet Explorer - still the same. I tried a more up-to-date laptop with Windows 7 (all software updated) still no menus with either Google Chrome or IE. Effectively all the reception predictions, transmitter channel data, engineering conditions, EVERYTHING has gone except the news column. I eventually found that if I 'googled' reception predictions or something like that, I could get the web address of your predictions page, but I couldn't input my postcode or location, because there are no menus there either. I used to use the prediction page regularly when going on holiday (camping) but because I can't enter a location I can't get that information any more. Any suggestions as to how to access your website properly please ? David Chappell: I'm fine on Windows 7 with Firefox, although I know that very old versions of IE are pants (in so many ways). Try another browser? The site dose work with IE11. News to Radio section will now work and menu will hide the left of the page. The site used to work with IE7 and earlier versions but think it has been redesigned to work with phones etc and lost its compatibility with older systems. Works with Google Chrome, although much slower and Chrome can/will open up random pages when used on any Web site. I use W7 and W8.1 with IE11 and Firefox 37.0.1 on both systems. This site works correctly under both operating systems and with both browsers in those systems. Could it be that some add-on is causing a problem? It is well known that some of the 'foistware' pushed out with some applications can cause unexpected difficulties. MikeP: I just updated my Firefox to 37.0.1and the navigation remains very poor to impossible compared with the original version of this site. Even the box to write comments in is not correctly displayed, with the lefthand edge of the box being ommited. Is the site still maintained? or is it just on automatic? I ask the question as yesterdays channel changes are not reflected in the data presented, and as far as my Transmitter is concerned (Oxford) changes that occurred last year have still to be updated.